. Published on January 30, 2019 . Usually any type of break over the school year is supposed to be relaxing. I mean, that’s why they call it a “break.” All of my breaks have been peachy, truly, up until the last one that I would ever have again. It’s not because I can’t slum it on the couch anymore while playing my Nintendo Switch, swapping out “Mario Kart 8 Deluxe” for “Pokémon: Let’s Go Eevee” (I’ve already beaten it and am almost finished with my Pokédex). No, no. I had ample amount of time to do that the first week of my last winter break. I sank into my couch, did not wash my hair (which you shouldn’t every day, it’s not good for it [insert justification here]) and seriously just CHECKED. THE F*CK. OUT. Why? Because I graduate in a little over four months, and the remainder of my winter break was full of serious job hunting and panic attacks. 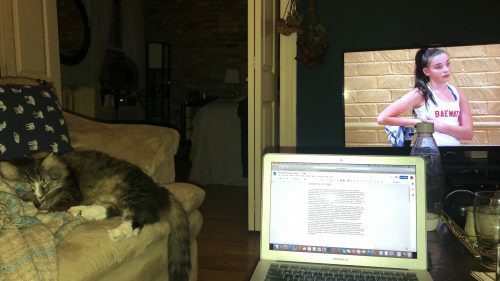 SPOTTED: Kipler snoozing while I write a cover letter for a job application, feeling like Kendall, resenting what I love because others (kip) ruin it for me. It’s not easy to get out of your own way and get the job done. During the last break before your last semester in the MFA Photography program at Columbia College Chicago, you don’t get the luxury of blowing off every day like maybe you could in your first year. It’s important to start looking for jobs, residencies, teaching opportunities, etc. in January…like, now. And from then on out, you never really stop. What do you want to do with your artistic practice? What do you want as a career after school? Analyze these two questions with a five year plan. Now, write down everything you need to accomplish in order to meet your goals. Some of those tasks you might have already completed while in school. Others, you realize you might need to try some new things. YES QUEENS: My colleague Marcella Flury (gold dress) and I (self portrait under left) complimented each other wonderfully in BREAK-A-LEG, a performance-based photo show. It’s (still) important to enter shows, publications, or anything else you can get your work in over the break. That’s another thing to stress. 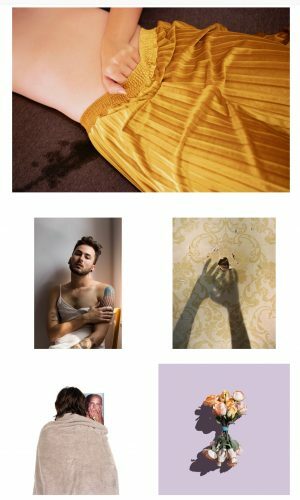 I managed to get my work into a performance-based photographic exhibition, and a Photo Editor at PDNedu reached out to me for a potential slot in their publication. I jumped on it, of course, and was just notified that it was accepted. I’m not sure how these connections are made, but I do like to think it’s because of the MFA Photography program at Columbia as well as my hard work during my time here. It’s a truly, truly humbling experience that I will cherish forever. Anyway, I can’t talk much more about that because if I try and give guidance to anyone but myself right now I will lose it. Sometimes it’s emotionally draining to get yourself to the computer to look for those opportunities. If you’re like me, then you’re an anxious person who takes a minute to get started, and it’s important to remember that’s okay. As long as you get to it and dedicate some time towards your future. Once school rolls back around, you will NOT have that much time to do so, unless you want to be up at two in the morning depriving yourself of sleep. It’s just not possible. Okay, I said I was done with that hard truth, and I am now. SHAMEFUL: Kenneth holds a wine cup (only briefly) over his just purchased book, The Rug’s Topography, signed by Rana Young (left). I was fortunate enough to be able and enjoy the city, the art in its museums and galleries, and just take some time to myself. Those days were on the weekends, when my partner was working (I dedicated work days for the weekend to try and keep my routine feeling normal as possible). 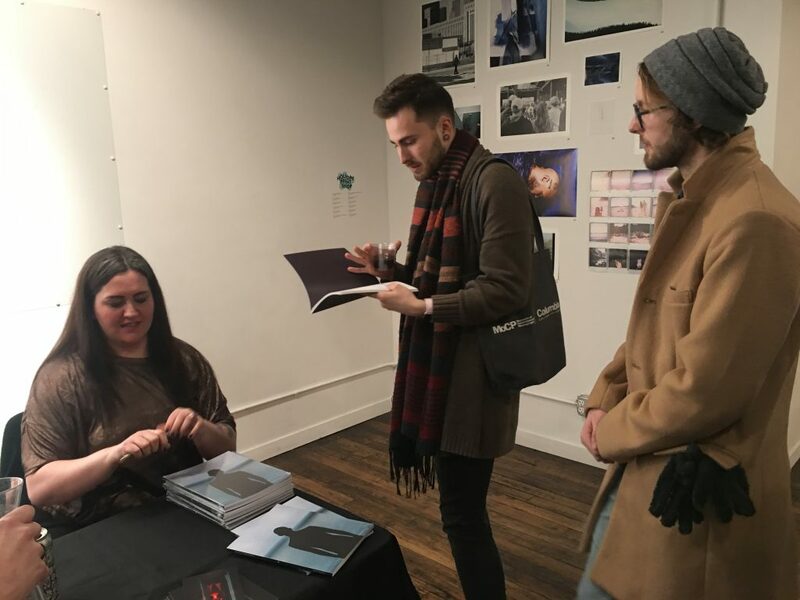 Rana Young, an amazingly talented photographer currently living and working in my native Arkansas, came to Chicago for a solo show and book launch and signing hosted at Filter Photo. As I want to write about her in my thesis paper and use her work as reference and defense, I knew I had to go meet her, connect with her, and let her know my intentions. Although we knew of each other through Instagram and the art community, we had never met. If I weren’t in Chicago, at Columbia, I don’t think that would have happened, so for that I’m thankful. The next morning, my partner and I made our way to Dawoud Bey’s opening at the Art Institute of Chicago, Night Coming Tenderly, Black, which of course was a wonderful show. It’s always amazing and sort of surreal to remember that he’s one of my professors at Columbia.